Borussia Dortmund made an impressive first league Champions’ League semifinal against Real Madrid by winning 4-1 with four goals from Lewandovski. They will probably qualify for the final, like they did before in 1997, when they played against Juventus Turin, winning 3-1. But what I want for people to remember is that Lewandowski, Hummels, Goetze, Sahin, Kagawa, Reus or Schmelzer, all the youngsters that contributed more or less to the teams’ continuous performance since the summer of 2010 aren’t the only footballers with fresh blood that brought trophies and fame on Westfallenstadion. In 1997, 16 years ago a boy wrote history as he scored in the last act of the UEFA Champions’ League final a stunning goal after only 16 seconds passed from the moment he was ‘thrown’ on the pitch. His name?! Lars Ricken! A blonde young boy with an earring – which at that time was something quite unusual – secured his teams’ 3-1 victory for the first ever and only until now European supreme crown. 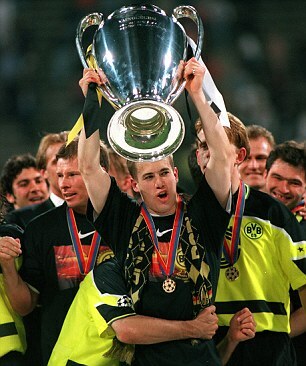 But for the 21 year old midfielder, born in Dortmund, the road begun much more early, as he was used into an official game, for the first time, in 1994, when he wasn’t already 18 years old. 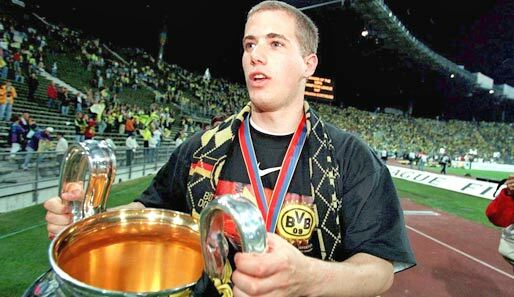 Born in Dortmund, he was breed in Dortmund, meet all the success he could get in Dortmund and retired in Dortmund, after ending his career at the second team. A career dedicated only to Borussia from a very talented young player about whom specialists always said that he could have played at a much higher level. 301 league games and 49 league goals are decent numbers for a guy who played 13 years in Bundesliga, but, unfortunately, the injures forbid his possibilities to achieve much more in his career both at Borussia and at the German national team. He did won three league titles, in 1995, 1996 and 2002 and gathered 16 caps and one goal for his country, alongside which he became World vice champion in 2002, even though only as an unused substitute, but the perspectives seemed wider. At only 31 years of age, in 2007, he was sent to the second team as he didn’t meet the first squads’ coach expectations. He struggled there, fought for regaining his position but finally failed in doing so and announced his retirement from professional football in February 2009. Thinking a bit, with a bit luck he could have taken part, at least as a substitute in the second final which Borussia will play for sure in this year… So, remember this guy, because until this day he, alongside Michael Zorc, is the only player who dedicated his entire career to Borussia, to win the Champions League with the yellow and black side. Now, in this position are Goetze and Schmelzer… But Goetze already signed a contract with Bayern starting the next season. A shocking hit for his fans, but the betrayal has already happened and Mario preferred to continue at the greatest rival. Meanwhile, Lars didn’t leave Borussia for a single day – excepting a short forced trial at Columbus Crew in 2008 – so for this we have to remember that before Jurgen Klopp’s side, there was a great one from which a one club young boy stood up from the rest! Acest articol a fost publicat în Campioni și etichetat 1997, 301 matches, 49 goals, Borussia Dortmund, Champions League 1997, Champions League final, Germany, Juventus Turin, Lars Ricken, Mario Goetze, Mario Gotze. Pune un semn de carte cu legătura permanentă.